The countdown to Phineas and Ferb The Movie has begun at our house! Phineas and Ferb is JD's favorite cartoon and I am not ashamed to admit that our whole family loves watching it too, so when we heard that a Phineas and Ferb movie was being released we were all so excited. 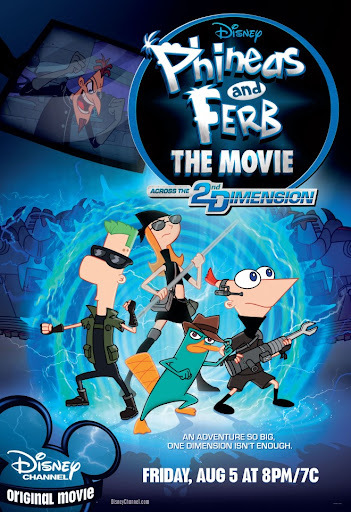 Although there is a sneak peek today (On Demand) we plan on waiting until Friday to have a Phineas and Ferb Movie Night! If you plan on having your own movie night, stop by Target. They have tons of cool Phineas and Ferb items in their dollar section! Phineas and Ferb: Across the 2nd Dimension will premiere on the Disney Channel on Friday, August 5 at 8:00pm ET/PT, with a sneak On Demand preview beginning on August 1. Muriel, I catch myself watching it even when JD's not around,so I'm totally with you on that one, LOL! Isela, we are definitely bringing out the popcorn machine, if you guys wanna come by, you are more than welcome too, it starts at 8 on Friday!